Jeremy Corbyn, the leader of the Labour Party in Britain, visited Palestinian refugee camps in Jordan Saturday and declared that if his party wins the country’s next election (in 2022), he will recognize the Palestinian state. Corbyn wrote on Twitter, “The next Labour government will recognise Palestine as a state as one step towards a genuine two-state solution to the Israel-Palestine conflict”. This is not the first time that the British Labour Party has vowed to recognize Palestinian sovereignty. Most recently, after narrowly losing the 2017 election to Theresa May’s Conservative Party, Corbyn himself spoke in favor of Palestinian statehood. That statement was made at an event protesting the hundredth anniversary of the Balfour Declaration, which was a declaration made in 1917 by Lord Balfour, the British Governor in Palestine at the time, declaring that the land could serve both as home to its existing residents (Palestinians and a small minority of Samaritans and Jews), and as a homeland for the Jewish people. 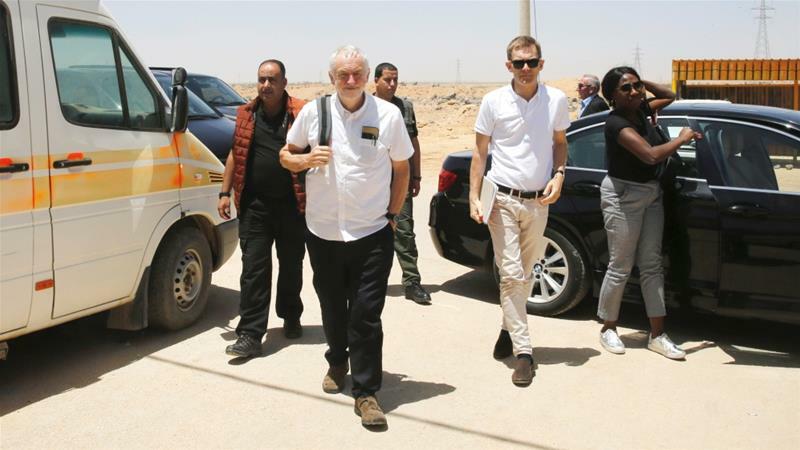 In addition to visiting refugees in the Al-Baqa’a camp, Corbyn also went to the Al Zaatari Refugee camp near Jordan’s border with Syria. He visited the market in Al Zaatari, and also visited a solar power plant.